The Oneida Area Civic Chorale will present “Pops Goes the Chorale”, on Saturday, March 11, at 7:30 PM and Sunday, March 12, at 4:00 PM at the Kallet Civic Center in Oneida. The concerts will be directed by Kimberly Nethaway of Rome, and accompanied on piano by Bernadette VanValkenburg of Sherrill and Tina Toglia of New Hartford. Guest artist will be local musician Gary Johnson. Concert seating will be cabaret-style, and a cash bar, treats and desserts by Sweet Indulgence will be available. “Pops Goes the Chorale” is the second concert of the 100-voice, non-audition community chorus’s 50th Anniversary Season. The program will include favorite pop songs that the OACC has performed over the last five decades, as well as a few newer hits, and several singers will perform solos. Don Drake of West Winfield and Twyla Edwards of Ava will solo on the Simon and Garfunkel hit, “Bridge Over Troubled Water”, and “Always Look on the Bright Side of Life”, from the musical “Spamalot”, will feature solos by John Nethaway of Rome and Rob Wright, Oneida Castle. 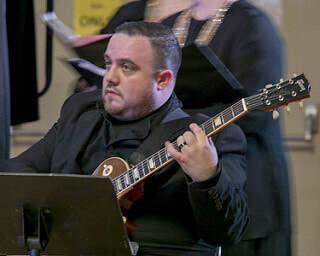 Mark Maginn, Oneida, will perform a solo on the Leonard Cohen classic “Hallelujah”, and ABBA’s “Thank You For the Music” will include solos by Sarah Terrell of Sherrill and Kathy Gay of Oneida Castle. The Chorale will also perform the 2015 Adele hit “When We Were Young”, with a solo by Lorraine Burney of Richfield Springs. The women of the Chorale will sing “Second Hand Rose”, by Grant Clarke and James F. Hanley, with a solo by Becky Ewen of Oneida. The men will perform Lerner and Loewe’s “Get Me to the Church On Time”. Chorale member Amanda Yeoman will provide flute accompaniment as the group sings “Into the West”, by Walsh, Shore and Lennox. 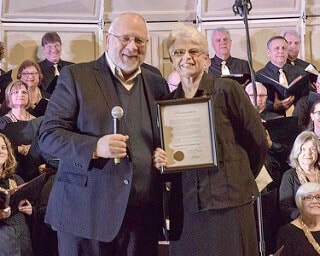 Guest Artist Gary Johnson of Sylvan Beach will perform with the Chorale as a special 50th Anniversary Season treat. Johnson, an Oneida High School graduate, was the Chorale’s 2001 Senior Scholarship recipient. He is now a National Touring Musician who performs on approximately 100 college campuses per year. He was awarded Campus Activities Magazine's 2014 Musician of the Year and nominated 2015 Male Performer of the Year. Johnson has collaborated with several multi-platinum selling artists, including former members of Boston, The Fray, Breaking Benjamin, and more. He recently contributed original music for the Multi-International Award Winning motion picture "Beyond the Mat", and is currently preparing for the International Release of his highly anticipated sophomore album. When not on tour, he spends his time in Upstate NY with his wife and daughter, where he is a volunteer firefighter and founder of an award-winning Animal Rescue. At the concert, Johnson will perform as a One Man Band, and his songs will be chosen by Text Request from the audience. He will spontaneously replicate all of the instruments, vocals, background vocals, and even special effects using only his guitar, his voice and a one-of-a-kind loopstation.